Length - 10 m, width - 8,5 m; length of a wing – 6,3 m, width - 6 m. Rectangular, with a wing for the engine facilities, 2-storey with a basement and a shelter lighted by the windows of 2 rear facades. The rear facade of the mill is considered as the main façade. When approaching the mill, it is seen as a very pronounced element of the landscape. Windows, doors are fronted by bricks; junctions of outside walls are set of bricks. A masonry connection of field stones with an ornamental strip set of bricks has preserved in the rear facades. The building includes industrial and residential premises. The premises of the basement are covered with cross-set bricks. 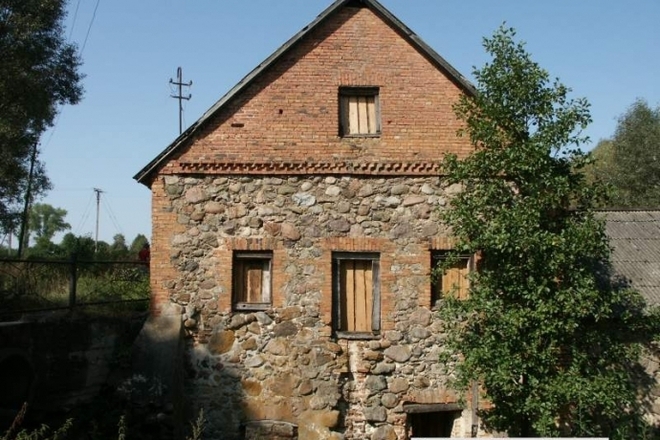 The watermill belonged to the homestead of Žalvariai manor.